It’s Super Saturday at Flemington and the Ballymore team will present a quality line up of gallopers including the high class Tivaci (pictured) who will look to enhance his stallion prospects when he lines up in the Group 1 Lexus Newmarket Handicap over 1200m. To be ridden by stable rider Patrick Moloney, Tivaci is out to cement his stallion credentials before heading back to New Zealand to stand at the prominent breeding powerhouse Waikato Stud. Tivaci is the fastest son of champion sire High Chaparral in the world and will jump from barrier six in the Flemington feature. Gun three-year-old Barthelona looked to be back on track at his last outing when running third at Moonee Valley and is in good shape ahead of his Listed event over 1100m. 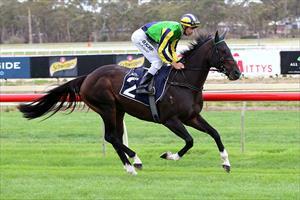 Last start winner Sognani steps up in class as she looks to tackle another solid line up of three-year-old fillies in the TAB Kweney Stakes over 1400m. Moroney was the first to admit it is a ‘step up in class’ for the daughter of Magic Albert, although does deserve her chance and is much better than her 100-1 odds suggest.